Prisons are seldom mentioned under the rubric of labour market institutions such as temporary work contracts or collective bargaining agreements. Yet, prisons not only employ labour but also cast a shadow on the labour force in or out of work. The early labour movement considered the then prevalent use of prison labour for commercial purposes as unfair competition. By the 1930s, the U.S. labour movement was strong enough to have work for commercial purposes prohibited in prisons. In the decades following, the number of prisoners decreased to a historic minimum. But with cutbacks in the welfare state, the prison population exploded from about 200,000 in 1975 to 2,300,000 in 2013 (Scherrer and Shah, 2017: 37) and prison labour for commercial purposes became legal again. Today, about 15% of the inmates in federal and state prisons perform work for companies such as Boeing, Starbucks and Victoria’s Secret. Migrants detained for violating immigration laws are one of the fastest growing segments of prison labour. Under the Trump administration, their numbers are most likely to increase. Using the example of the U.S., we will discuss drivers of the return of commercial prison labour. The drastic expansion of the penal state was driven especially by the widening of statutory offences for non-violent delicts – such as drug abuse or public urination – and increased minimum penalties. The conservative administrations’ ‘war against drugs’ reveals the racist dimensions of the mass incarceration. The people imprisoned because of substance abuse did not at all reflect the actual proportions of drug consumers. Whereas the Afro-American population constitutes only 13% of drug consumers, roughly corresponding to their demographic weight, they represent three quarters of all those who were imprisoned because of drug-related offenses (Wacquant, 2009: 61). The transition toward a penal state is closely linked to cuts in state welfare spending. The U.S. prison population is especially large in U.S. states with traditionally lower social security benefits or with big cuts to the social security net (Beckett and Western, 2001). While social programmes aim at social peace, the objective of prisons is disciplining. The prison is an expression of ‘social disapproval’ toward groups with little success in the labour market. It degrades them morally as well as factually to second-class citizens (Alexander 2010: 208). To date, more than 6 million people in the U.S. have lost their right to vote due to a police record. The deterrent, disciplining moment of this policy of mass incarceration lies in demonstrating the lack of alternatives to precarious work and living conditions, which cannot be circumvented either by hanging around in the streets or by profitable illegal deals such as drug trafficking. Those who resist the discipline of the work society have to expect prison. The consistent disciplining of ‘superfluous workers’ (Gans, 2012) through mass imprisonment resulted in a steep rise in expenditure on security and prisons. In addition to overcrowding, opportunities for training and rehabilitation were cut to reduce costs. From there it was only a small step to propose using prisoners’ labour power as a source of income. The discourse on financing prisons and detainees moved from ‘public assistance’ to ‘self-financing’. Under neoliberalism, detention itself is becoming a self-inflicted penalty for which the prisoner and the prisoner’s relatives literally have to pay: processing charges for visits, rents for beds, and co-financing for medical care. In many cases, prisoners are released with bills for prison services of several thousand dollars (Levingston, 2007). By the late 1970s, federal and state legislation provided legal frameworks for private companies to contract with public prisons to exploit inmates’ labour. Work programmes at the federal level are rather transparent and trade unions as well as local companies are consulted, but state run programs overall employ a much higher share of inmates under undisclosed and highly exploitative conditions. In past decades, a patchwork of decentralized governmental, profit-oriented prison industries has developed. In Colorado, for instance, about 1,600 prisoners were employed in 37 different industrial sites in 2014 (Scherrer and Shah, 2017: 41). That was approximately 15% of the prison population able to work. Production ranges from manufacture of furniture and dairy products to services such as car repair or landscape gardening. Workers received an average daily wage of $3.95 (U.S.) in 2014. Thus the hourly wage, assuming a four-hour working day, remains under $1 (Scherrer and Shah, 2017: 41). The commercial exploitation of prison labour, although growing, only affects parts of the prison population. The majority of prisoners work on the preservation of the prison itself – for example in the laundry, the kitchen or food distribution. Without this work, the system of mass incarceration would hardly be operable, financially as well as organizationally. The privatization of prisons proceeded in parallel to the recommodification of prison labour. The private prison sector now guards about one tenth of all prisoners. Government agencies pay private companies per prisoner. Unsurprisingly, privatization has not resulted in savings for tax payers despite the paring down of personnel, declining wages and lower fringe benefits – circumstances which have been criticized by trade unions for years. Migration in particular has developed into a profitable branch for private companies. Mandatory detention for migration offences, which was introduced in 1996, resulted in a rapid expansion of deportation centres. By 2011, the daily average population of 32,000 detainees were kept in more than 200 detention centres. Just less than one tenth of all prisoners serve time in private prisons, but 40% of all immigration detention prisons in the U.S. are privately operated. Two major corporations – CoreCivic and the GEO group – provide one third of detention centre capacity. In 2012, these two companies concluded contracts worth $738-million (U.S.) with federal authorities for detention jails. The government pays for the prisoners as long as the companies meet a minimum quota (34,000 detainees at any moment, since 2013). Thus there is an incentive to detain as many people as possible, for as long as possible. Information about the working conditions in immigration detention prisons are provided solely by newspaper reports. Repeatedly, cases have emerged where migrants were forced to work without payment. About 60,000 migrants are estimated to be working in ‘voluntary’ labour programmes for a daily wage of less than $1 in privately and publicly operated institutions (Urbina 2014). Changes in prison labour practices might be brought about by the inmates themselves. Recently, several attempts at organizing have been reported. 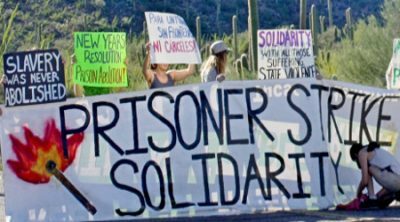 In September 2016, the Formerly Incarcerated, Convicted People and Families Movement (FICPFM) and the Incarcerated Workers Organizing Committee (IWOC) hosted a conference on mass incarceration and exploitation of prison labour. At the same time, prisoners required to work went on strike in a number of prisons. Unfortunately, they failed to get the topic of prison labour on to the agenda of the presidential elections. The media mostly ignored the strikes. In August 2016, the Department of Justice announced that it would end the use of private contractors to run its federal prisons after a report by its independent inspector-general highlighted massive safety and security problems in private prisons. Civil rights activists hailed the decision and already foresaw the end of an era. Less than half a year later, the Trump administration instructed the Department of Homeland Security to “take all appropriate action and allocate all legally available resources to immediately construct, operate, or control facilities to detain aliens at or near the land border with Mexico” (Hamilton 2017). The decision placed $40-billion (U.S.) for the fiscal year 2017 into the service of privately operated detention centres. Within hours, the stock prices of GEO Group and CoreCivic soared. Trump’s victory is likely to intensify the corporate takeover of prisons, exploitation of inmates’ labour, and profiting from criminalizing migration. These policies will also cast a shadow on labour: their disciplining force will be felt by marginalized segments of the labour force, and their dividing powers by organized labour. Therefore it is vital to join forces against neoliberalism, racial oppression, immigrant baiting and mass incarceration. Labour’s role should be to foster solidarity amongst social movements involved in these struggles. Christoph Scherrer is Professor for Globalization and Politics at University of Kassel, Germany. He is also executive director of the International Center for Development and Decent Work and a member of the steering committee of the Global Labour University. Forthcoming publication: Public Banks in the Age of Financialization: A Comparative Perspective , Cheltenham: Edward Elgar. Anil Shah was a research assistant at the subdivision Globalization and Politics of the Department of Politics at the University of Kassel. He has an interest in theories of global political economy and socio-ecological research. He recently published his master’s thesis, “Destructive Creation: Analyzing Socio-Ecological Conflicts as Frontiers of Capitalist Development” as a working paper. This is a short version of Scherrer and Shah (2017), first published on the Global Labour Column website. Alexander, M. (2010) The new Jim Crow: mass incarceration in the age of colourblindness , New York: The New Press. Beckett, K. and Western, B. (2001) “Governing social marginality: welfare, incarceration and the transformation of state policy,” Punishment & Society , 3(1), pp 43–59. Gans, H. (2012), “Superfluous Workers,” Challenge , 55(4), pp 94–103. Hamilton, K. (2017). “Cell high. Donald Trump’s immigration orders will make private prison companies filthy rich,” Vice News , January 26. Levingston, K.D. (2007), “Making the ‘bad guy’ pay: growing use of cost shifting as an economic sanction,” in T. Herivel and P. Wright (eds. ): Prison Profiteers: Who makes Money from Mass Incarceration? New York: The New Press. Scherrer, C and Shah, A. (2017) “Political economy of prison labour: from penal welfarism to the penal state,” Global Labour Journal , 8(1), pp 32-48. Urbina, I. (2014), “Using Jailed Migrants as a Pool of Cheap Labour,” New York Times , 24 May 2014. Wacquant, L. (2009), Punishing the poor: the neoliberal government of social insecurity , Durham: Duke University Press.